Phew. Encapsulating the past year in a blog post requires a level of dedication that someone who just made a four-layer dessert does not possess. Now that I’m settled in yet another (new) city, I feel ready to declare myself “baaaaaack.” I have my own kitchen with every gadget I could possibly need. (All that’s left is another oven.) I am entering fall, also known as prime baking season. And, most importantly, I am healed, both mentally and physically, from the challenging experiences of the past few years. 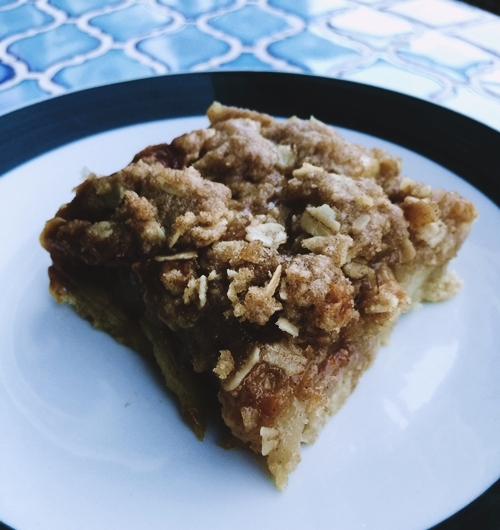 About those bars: imagine if an apple crisp mixed with salted caramel sauce and then melted into a shortbread cookie base. I know this recipe looks intense, but it actually comes together pretty quickly. Then again, I have a dishwasher again. I CAN DO ANYTHING. 1) Preheat oven to 350 degrees. Line a 9 x 13 inch baking pan with parchment paper. 2) Cut butter into 1/2-inch pieces. In a food processor, process the flour, sugar and salt briefly, then add the butter and process until the mixture begins to form small lumps. 3) Sprinkle mixture onto the baking pan and press the mixture evenly onto the bottom. 4) Bake shortbread in middle of oven until golden, about 20 minutes. Let cool completely while preparing other ingredients. Keep the oven at 350 degrees. 1) Follow these directions from Sally’s Baking Addiction. 2) Once the caramel has cooled and thickened, pour it over the cooled shortbread base and spread evenly. 1) Heat a large pot over medium heat. Add the butter and let it melt, then stir in the apples. Cook for about five minutes to let apples release their liquid. 2) Stir in the sugar, cinnamon, nutmeg and cloves. Let cook for another five minutes. 3) Stir in the cornstarch and cook for another minute, until liquid has thickened. Set apples aside to cool, then spread them over the salted caramel shortbread base. 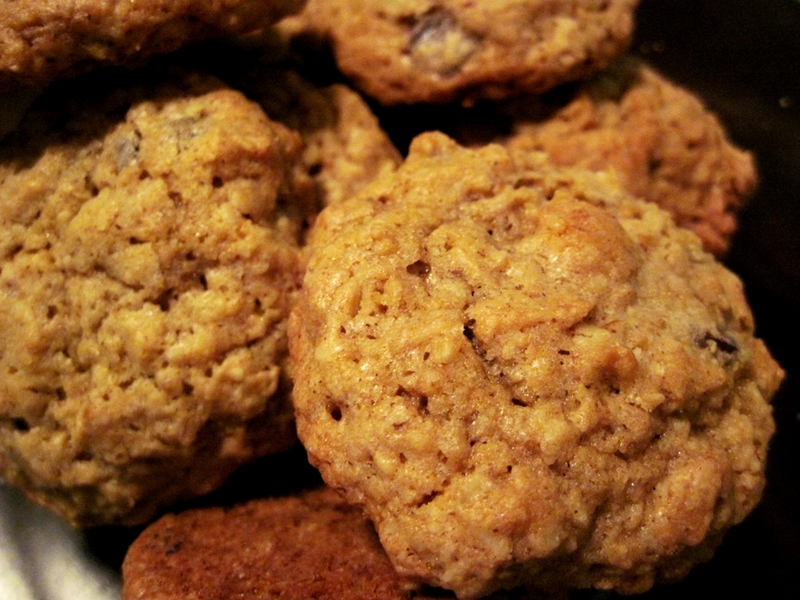 1) Mix brown sugar, oats, flour and cinnamon in a mixing bowl. Use a pastry cutter or paddle attachment on a stand mixer to combine cold butter into the mixture until it resembles coarse crumbs. 2) Sprinkle crisp crumbs over the apples in the baking dish and press crumbs gently into the pan. 3) Place the baking pan on a center rack in the oven and bake for about 30 minutes, until apples are bubbling and crisp looks, well, crisp. 4) Let the bars cool completely on a cooling rack before slicing. You might even want to refrigerate them for an hour to make sure that they don’t crumble. One day I was perusing Pinterest (addict that I am) when I came across a recipe for breakfast cookies. Read that again. Breakfast. Cookies. COOKIES YOU CAN EAT FOR BREAKFAST. Naturally, I had to adapt them for my own. 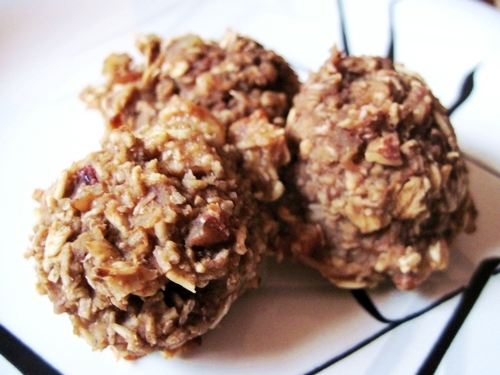 I added coconut for a little more sweetness, and nuts for crunch, but this recipe is easily altered to satisfy your tastes. I’m going to add peanut butter to mine next time. They make as good of a dessert as they do breakfast, too. 1) Preheat the oven to 350 degrees. Combine all ingredients in a bowl. 2) Spoon out teaspoonfuls of batter onto a baking sheet and bake for 30 to 35 minutes. 3) Let cool and store in an airtight container in the refrigerator. Lately, I’ve been thinking a lot about breakfast. Perhaps it’s the promise of new beginnings that pervades this time of year–the hope for a fresh start on January 1st and, by extension, each morning. The impending possibilities make me want to wake up and eat something delicious. Or perhaps my breakfast fixation evolved from my obsession with reading Ruth Reichl’s Twitter page. The former Gourmet editor posts an update nearly every day about what she’s eating for breakfast. I’m jealous of anyone who possesses the creativity and financial means to create a new breakfast every morning. That little girl would be very proud of this recipe, I think. 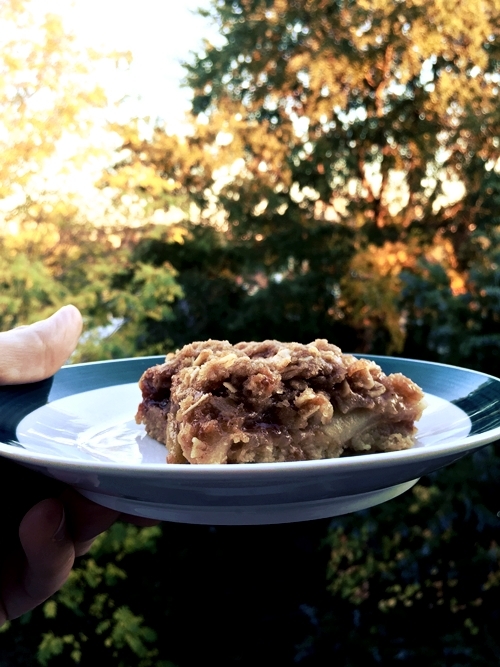 It still involves oats and brown sugar, but it’s also portable. And you can put it on practically everything without fearing judgment. There are oats! There are almonds! I’ve even done my part to Save the Bees of NC with local honey. May all your breakfasts be so hopeful ‘n’ wholesome. Until you read my post about cheddar bacon muffins. Then you have my permission to be bad again. 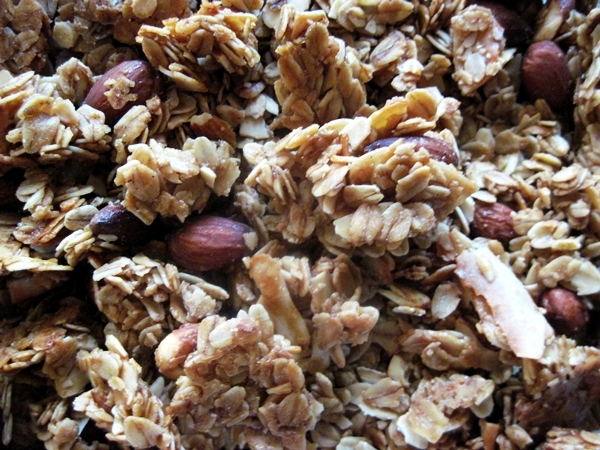 Granola recipe adapted from Joy the Baker. 1) Place oven rack in the middle of the oven and preheat to 325 degrees. Line one large with parchment paper or Silpat. 2) In a large bowl, combine oats, whole almonds, slivered almonds, coconut, cinnamon and salt. 3) In a medium saucepan on medium heat, melt butter, then whisk in coconut oil, honey and brown sugar until the sugar is dissolved and the mixture begins to boil. Remove from heat and stir in the vanilla extract. 4) Pour the sauce over the oat mixture and toss together with a spoon or two to ensure that the oats are covered thoroughly. 5) Press mixture down gently onto baking sheet. Bake for about 9 minutes. 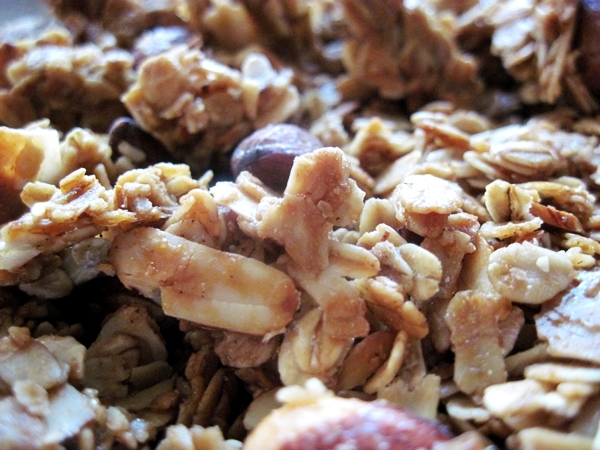 Remove from the oven, stir granola and place back in oven. Bake for another 9 minutes, stir again and put back in the oven for about 9 minutes more. 6) Let cool on the pan before placing in an airtight container. Also, if you’re looking for other delicious granola combinations, this basic recipe from Chocolate & Zucchini is wonderful. I’ll be posting more breakfasts over the next few days, especially now that my classes don’t begin until 3:30 on Mondays and Wednesdays. A few recipes will involve bacon. You know how I feel about bacon. Let me know if you’ve got a recipe I simply have to try, bacon-centric or otherwise. 1) My cat possesses healing qualities. His snuggles are therapeutic. 2) Completing craft projects is a reasonable and productive alternative to studying. 3) One should always have all the ingredients on hand to make simple, buttery cookies. The last one is particularly important. It’s the reason I buy butter on basically every grocery shopping trip. What if I run out right before a cookie dough craving? What if Paula Deen buys all the butter on the Eastern Seaboard? What if cows go on strike? Yesterday, my belief gained affirmation in the form of a snow storm. In early December. In North Carolina. Maybe “storm” is too generous, but once I saw that dismal fluffy stuff assaulting the lawn outside of our apartment, I knew I was having a snow day. As in a no-way-am-I-going-out-in-that-stuff day. Truly one of the best things you can do in winter is bake something with a lot of spices. The smell is more pervasive than a Yankee Candle, and the result definitely tastes better. 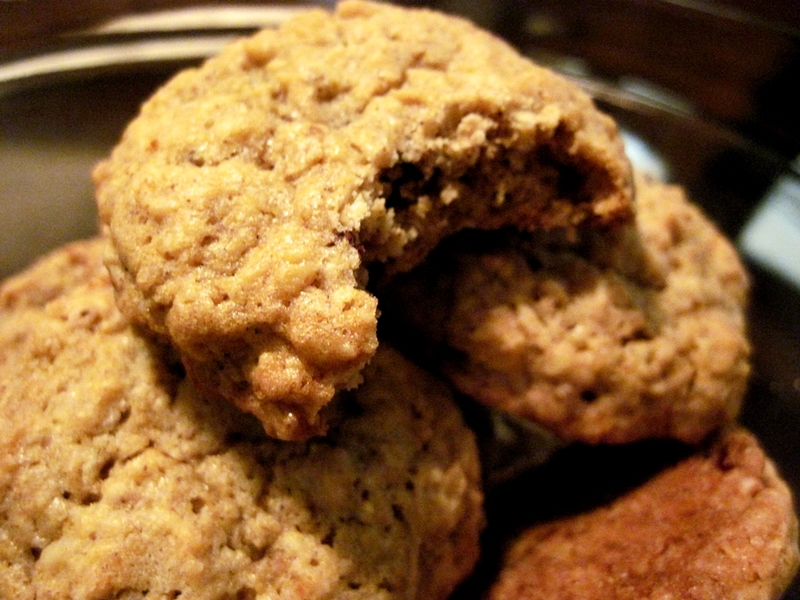 I used this recipe as my base, then found inspiration in my taste buds’ reminiscences of Whole Foods’ jumble cookie. They throw all kinds of fun edibles in those buttery delights. 1) Preheat oven to 350 degrees. In a large bowl, cream together the butter, brown sugar, white sugar and white sugar for several minutes. Add the eggs one by one, then add the vanilla and almond extracts. 2) Slowly stir in the flour, baking soda, spices and salt. 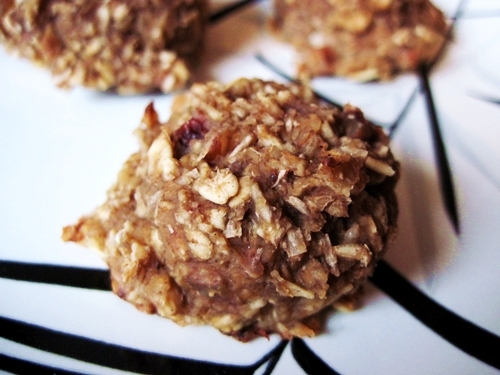 3) Pour in the oats, raisins, cranberries or cherries, chocolate chips and walnuts. You’ll want to taste-test the dough repeatedly to verify appropriate raisin/cranberry/cherry/chocolate chip/walnut dispersion. 4) Drop teaspoon-sized rounds of dough onto ungreased cookie sheets and bake for 10 minutes. Let set for another few minutes on the baking sheet before removing. Or eat them straight out of the oven. I won’t judge.